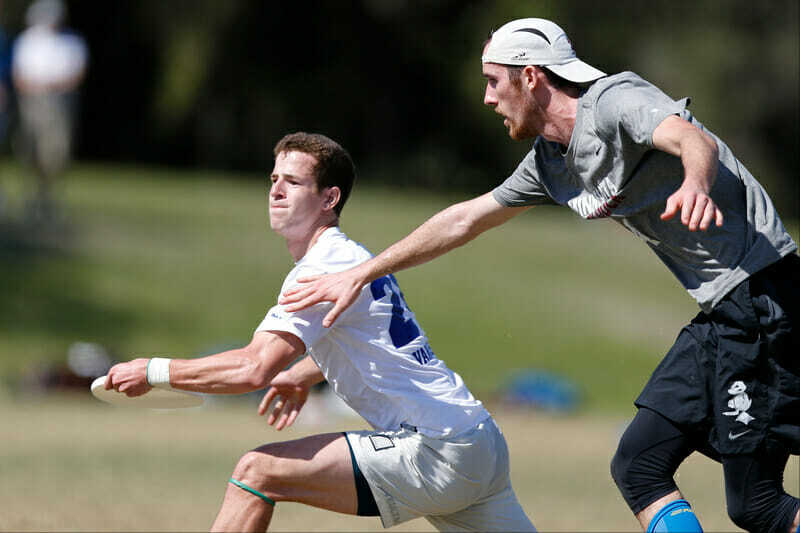 Ultiworld’s reporting on Florida Warm Up 2017 is presented by Spin Ultimate; all opinions are those of the author. Please support the brands that make Ultiworld possible and shop at Spin Ultimate! Ahh! The never-ending cornucopia of drama that is college ultimate. The teams that were expected to be playing late in the bracket in Tampa — like Minnesota and Pittsburgh — were there on Sunday, but so too were some Cinderellas, in Texas A&M and Northwestern. While Pittsburgh was crowned champion in a decisive final victory, there was no shortage of exciting games and parity at this incarnation of Florida Warm Up. With so many upsets and conflicting results, it can often feel like three days of elite tournament play does more to muddy the rankings discussion than make it clearer. For example: Arkansas beat Auburn, who beat Texas, who beat Wisconsin, who beat BYU, who beat Texas A&M, who beat Florida (twice), who beat CUT, who beat Minnesota, who beat Pitt, who won the tournament. But that’s a problem for the rankings crew to sort out later this week. For now, here’s a rundown of what we saw in Tampa. It’s safe to say that #13 Pittsburgh En Sabah Nur’s reputation over the last half decade would put them a little more on the “offensive finesse” end of the play-style spectrum than the “fierce defensive” end. That might all be changing. Hogan made that comment after his team had defeated #10 Texas A&M, #4 Wisconsin, and #3 Carleton consecutively, with a +16 point differential. Not a bad stretch. That returning unit, who was key in a National semifinals push in 2016, has an interesting combination of defensive specialization and disc skills. Fifth year Sam VanDusen’s towering hucks can create assists from anywhere on the field. Guys like Carl Morgenstern, Saul Graves, and Kevin Tang cover handlers as well as cutters and patiently run the offense on a turn. Perhaps most important to their defense has been the emergence of sophomore Mike Ing, who has played his way to being Pitt’s top coverage man, and one of the deciding factors in the final against Minnesota. Minnesota handily beat Pittsburgh on Saturday, dealing them their only loss on the weekend. For the first time all weekend Pitt’s defense wasn’t able to generate any chances, and at times failed to even slow Minnesota’s fast offensive attack. Pitt had only one break opportunity when Minnesota dropped an uncontested in cut near the sideline. They would not convert. Final score: 13-8. The tournament final a day later was a very different story. The defensive adjustments Pittsburgh made after their first meeting gave Minnesota fits. A normally calm and cohesive handling backfield suddenly had multiple miscues and found themselves in a few high stall situations. Pitt experimented with new matchups. Saul Graves spent time working against Tony Poletto, and Ing, who usually covers their opponent’s top cutter, moved onto speedy handler Wyatt Mekler. While Minnesota certainly didn’t play to the level they had for much of the weekend in final (their defense was unable to manage a break), it was the fresh looks Pitt gave that made the difference in the meetings. Down 3-0 and desperately needing a hold, the Duck offense turned it over four times against Pittsburgh’s second defensive team. Hafeez Shams hit Sam Jennings with a cross field flick to make it 4-0 and that’s when the game really got out of hand. Pitt cruised the rest of the way, 15-7. Only one day later and Pitt found a way to make up 13 points (from a 13-8 loss to a 15-7 win) without stacking lines. Good news for Kaczmarek and company. Bad news for the rest of the division. Last year #7 Minnesota Grey Duck proved in no uncertain terms that they were the deepest team in the division. They were riddled with injury at Nationals but called upon their bench players to step up and be great, and the roster delivered. While Grey Duck lost important pieces like 2016 Callahan nominee Ryan Osgar, as well as Soham Shah and Connor Anderson, the 2016 national champions have somehow reloaded. “We’ve got a lot of new guys, we’ve got a lot of young guys and we need them to step up,” head coach Tallis Boyd said of the infusion of new blood into Minnesota’s program. It’s an interesting group of additions for Boyd and Grey Duck. Like always, there are freshman rookies. But there are also two fifth year transfer students who made a huge impact for their new team this weekend. Charlie McCutcheon and Charles Weinberg both played for the University of Delaware and are now both in graduate school for engineering at Minnesota. At Warm Up, Weinberg plugged into the starting offense for Minneapolis with few growing pains, as evident in his three goal and two assist stat line in Saturday’s win against Pittsburgh. McCutcheon is a totally different type of player from his old Delaware Sideshow teammate. McCutcheon, who played for the Philadelphia Spinners and will likely go down in history as the last MLU Championship MVP, was a defensive ace for Minnesota all weekend long. Quick and explosive, McCutcheon is able to take on the opposition’s primary downfield weapon regardless of size. On Friday, he was able to match up well against Central Florida’s Michael Fairley, despite being at a size disadvantage. It’s no secret what Minnesota wants to do on defense. Like last year, Minnesota came to Tampa and would only run one defensive set. And for much of the tournament, layout blocks were in no shortage for Minnesota. Standout freshmen like Jonah Malenfant, Oscar Leinbach, and Cole Jurek (a WJUC U20 alternate) all got tons of reps on the defensive line against the quality field at Warm Up. The young guys represented themselves well, and when the opportunity was there, they made plays. At 10-7 in their first game with Pitt, Jurek produced a massive takeaway when he picked the pocket of his man with a nutty layout block on a horizontal cut. Other than a flat, uncharacteristically bad performance in final, it was a great weekend for Grey Duck. If the number of “Wait, who is that guy?” moments is any indicator, Minnesota will be right back in the thick of the conversation in late May. Injuries and a lack of practice changed the complexion of Wisconsin from the word go this past weekend. Little went right for the #4 Wisconsin Hodags on Friday as they dropped games to Pittsburgh and Florida, while their offense at times struggled to complete in cuts and establish flow. 2016 1st Team All-Region handler Avery Johnson and D-line handler Eric von Kampen were unable to cleat up for any action at Warm Up, while other offensive weapons like Graeme Kernick and Ross Barker were lost over the course of the weekend, which kept the Hodag personnel and positions off balance. Wisconsin also spent the first day of play without key D-line presence Chris Wilen. The energy and intensity that has become synonymous with Wisconsin did return on Saturday and Valdivia’s group was able to bounce back with a hard fought, narrow 12-11 loss to Texas, a win over an impressive Brigham Young, and a 13-3 drubbing of Cornell. Practice time — let alone outdoor time — has been at a premium for Wisconsin so far in 2017. Due to some scheduling issues, the Hodags had just one practice before Warm Up and will have only one more before Stanford Invite. Even with all the injuries, the genetic makeup of Wisconsin players is such that they just play great defense all the time, and that was still true at Warm Up. Wisconsin will only improve from here. A 4-3 record versus Warm Up competition is a good weekend for most teams in the country but the bar is so much higher for #3 Carleton CUT. Let’s be honest, it was a bit of a shock not seeing Carleton in the bracket on Sunday. Florida was in the bracket. Texas A&M made it. NORTHWESTERN – HELLO??? The weekend started off according to plan. CUT beat Florida State and followed it up with a bit of a head turning 13-10 win over North Central rival and reigning national champs Minnesota. From there it looked like Carleton was ready to roll. But then they had a letdown a game later with Pitt, trailing 8-3 at one point before losing 13-10. On Saturday, Carleton seemed to have some problems that affected them in the second half. They watched an 8-5 lead slip away in a loss to Central Florida, then gave up some late breaks to Florida in a losing effort under the lights. What gives? More than any other team, CUT is heralded as a team that values the process. That includes not only the things that need reps on the field, but also off the field. Even after a loss or in a tight game, frustration appears absent. Though we may have to wait a little longer for 2017 Carleton to reveal its final form, they did a lot of things really well in Tampa. Elliot Mawby excelled both in the lane shutting down cutters and in the air. Eric Taylor’s deep pulls pinned teams in their own end, while defenders like Sol Yanuck made movement tough for opposing handler corps. Also, they went 2-0 against the North Central region (Minnesota on Friday and Wisconsin in consolation). They won North Central Regionals last season, even though Wisconsin nearly made the national semifinals and Minnesota won the whole thing. If you’re Carleton and you had to pick two games to win all weekend it would be those. For a Texas team trying to get back to Nationals after missing out in 2016, player development is going to be key. So #11 Texas TUFF brought a bunch of less experienced defenders and put them on a line together with stalwart Logan Kinney. It was their job to find a way to get breaks without significant help from offensive standouts like Joel Clutton and Dillon Larberg. Texas stuck to their guns and the young defense came through in some clutch moments. Under the lights Friday night (the Friday Night Lights, if you will) against Central Florida, they earned a go-ahead break to make it 11-10 en route to a 13-12 victory. The following day in a win against Wisconsin, they broke to go up 11-10 yet again, as Daniel De Los Santos out-positioned his man on a screaming backhand huck from Kinney. Another notable defender for TUFF was sophomore Vinay Valsaraj, who rounded into form as the weekend went on. The known quantity here is how good and lethally efficient Texas’ offense can be. In a point that took no more than 15 seconds against quality Wisconsin defenders, Larberg collected a 25-yard in-cut and hit Clutton on a 25-yard in-cut, who served up a touch away pass for Luke Simerly and the goal. “Easy pickins” as a Texas parent remarked. If Texas’ defense can keep improving, we’re likely to see TUFF back at Nationals in 2017. The South Central region figures to be a brutal brawl and Texas has what it takes to survive. But their long-term projections suffered a dark turn during the weekend. Larberg suffered an apparently serious shoulder injury against Auburn on Saturday and the early word is that he will need surgery. As one of the best players in the South Central, TUFF’s end of the season finish will go hand-in-hand with Larberg’s recovery time table. The low-key stat of the weekend would be how much total water weight Michael Fairley and Kyle Reedy lost from Friday to Sunday. With the possible exception of Florida’s Billy O’Bryan, those two may have played the most points of anyone at Warm Up for #17 Central Florida Dogs of War. The stat lines correlate appropriately to their subbing strategy. In Friday’s game with Minnesota, Fairely and Reedy went off with two goals and three assists each. Later that night against Texas, Fairley threw a whopping seven of Central Florida’s 12 assists. You cannot look past the Dogs’ top-end talent: the squad’s Callahan nominee Fairley, Reedy, Florida State transfer Cole Friedes, speedster Zach Good, defender and distributor Ben Osterman, and the 6’7″ or so Adam Lapikas, who was created in the original towering archetype of UCF players. Central Florida found themselves up early or at least on serve in most contests (they led Minnesota 5-2 at one point before running out of steam), but their signature win was a wild second half surge against Carleton in which the Dogs trailed 8-5, before rallying back to win 13-10. Cole Friedes had one of the best plays of the weekend when he skied a pair of defenders for an early break. With the best seven to ten players they can put on the field, UCF is a team that no one wants to play at 9 AM or in a game-to-go. If this team can make life easy on themselves offensively — and have more to burn on defense — we should be in for another exciting Southeast Regionals. Plus, the Nationals format always favors teams with a short bench. Alright, alright, yes, Northwestern NUT had an easy schedule. But the fact of the matter is Northwestern beat every team they played except for Minnesota, and they actually gave Grey Duck a pretty tough time of it for the first three-fourths of their semifinal matchup. That said, Northwestern didn’t really have a marquee win on the weekend. The win over Texas in quarters was impressive, but TUFF was without Dillon Larberg. And their double game point win over Florida State in the tourney opener was watered down by FSU’s ensuing results. Bu Northwestern’s overall body of work, and their passing of the eye test against lesser opponents certainly warrants praise. Northwestern doesn’t have a bevy of spectacular individual players, but cutter Ben Spielman had one of the best weekends of any player in Tampa. The savvy veteran cutter timed his cuts superbly, and had enough athleticism to make elite defenders look foolish at times. One particularly fun matchup was with Minnesota’s Charlie McCutcheon in the semifinal. McCutcheon got a couple of nice blocks early on deep shots and his team obviously won the game, but Spielman got the better of him a handful of times, including one posterizing sky for an emphatic second half goal when Northwestern was still in the game. Spielman was the most electric player on Northwestern’s O-line, but primary handler Elan Kane was just as important to the team’s successful weekend. Kane, a grad transfer from Division III Brandeis brought a remarkably reliant steadiness to pace the offense. He didn’t take many risks, but he was a perpetually consistent ball handler and drove the Northwestern offense down the field, letting his cutters win their matchups rather than forcing 50-50 looks downfield. Northwestern’s real bread and butter is on the defensive side of the disc. The team used two distinct D-lines, apart from the use of a kill line to break for half on South Florida. Reminiscent of Florida State’s defenses that saw them rise to the top of the division a few years ago, both NUT defensive lines are replete with laying out maniacs constantly applying pressure. Kyle Rutledge is a laudable downfield defender and captain Jay Valdillez is a nice player as well. But Northwestern’s strength is in their depth of hard-nosed, fundamental defenders. Their two lines keep each other fresh and allow the team to wear down their opponents over the course of a game. They’ll have to work on D-line offensive efficiency to make more of their break opportunities, but Northwestern’s defense was definitely one of the more impressive on the weekend. NUT doesn’t really have the stable of dominant athletes to go toe-to-toe with the top offenses in the country — that was evident in both games against Minnesota — but they do have plenty of nice pieces and play a sound, consistent style on both sides of the disc. For what it’s worth, the last time Northwestern made semis at Warm Up, they earned a strength bid for the Great Lakes. This year’s third place team looks more than capable of matching that feat — and going one further by actually making the big dance. Northwestern was not the only surprise semifinalist of Warm Up. #10 Texas A&M Dozen has been on the national scene for a while but never without their big name stars. This year, there’s no Matt Bennett and Dalton Smith. Dozen is far from out of options, however. There have been capable guys waiting in the wings — maybe not world beaters like Smith and Bennett — but players that are ready to step up and take center stage. Captain Carter Hollo and Connor Ughetta anchor an offense that, like the guys at the helm before them, are not afraid to go deep to tall targets. Dozen had an up and down weekend in Tampa, notching two wins over Florida and a victory over Auburn, but getting smoked by both finalists, as well as dropping games to unranked1 BYU and Northwestern. A&M is still trying to find itself in 2017 and should learn plenty from playing the kind of heavy hitters Warm Up offered. Some of the defense Hollo mentioned bubbled up in the second half of semifinals while they were getting routed by Pittsburgh. Captain Zach Marbach came out of nowhere and had two chest-high catch blocks, and suddenly A&M capitalized on three straight break opportunities. Dozen would lose 15-9 but they gave a glimpse of what they’re capable of. A&M will need more defensive efforts like that to get past Texas and out of what will likely be a two bid South Central Regionals if they want to make their fourth straight trip to Nationals. It’s becoming more and more of a shame that we don’t get to see BYU CHI in bracket play. And it’s even more of a shame that we won’t get to seem them on the game’s biggest stage, because based on their performance at Warm Up, they are without a doubt a Nationals-caliber team. Playing only on Friday and Saturday, BYU registered a 6-2 record for the tournament, notching victories over Texas and Texas A&M, playing Minnesota to double game point, and generally appearing as strong as any other squad in Tampa. BYU doesn’t necessarily have a game-breaking player among their ranks. Their strength lies in the sheer number of solid, athletic players on the roster. As their head coach Bryce Merrill said, what separates this team from others is players 10 through 20. BYU trots out player after player, who are all fundamentally sound, athletic and physical, and reliable throwers. They have no obvious, overwhelming weapon that they’re going to beat you with — though their especially efficient long balls would be the closest thing to that — and they don’t have any glaring weaknesses either. Jason McKeen and Robert Bodily are two physically imposing, dangerous throwers who, together, are capable of taking over games for CHI. And Seokhee Burningham is a churning, dynamic cutter who works his way open at all levels of the field. Jordan Hill, Will Honey, and Benjamin Hodson were also amongst those who showed moments of brilliance for the team from Provo. But you can’t talk about BYU without talking about their unique situation. CHI has done a remarkably impressive job on the field over the past couple years, but USA Ultimate’s decision to not make Series accommodations for a team who refuses to play on Sundays still hangs over them. Right now, BYU is fighting to make their season more about what they do accomplish than what they will not be allowed to accomplish. And their performance in Tampa should go an awful long way in doing that. Their 13-11 win over Texas, according to Merrill, may be the biggest in program history. That win, along with their consistently solid play all weekend, mean that, at least for now, BYU’s season is more about the team’s impressive play than it is about the frustration of their plight. Florida had an odd tournament, but definitely had more highs than lows. With players showing up at different times throughout Friday, Florida lacked the intensity and execution to put away a couple of lesser opponents in Villanova and Brown to start their tournament. Florida needed late surges in both games to come back and avoid the upset. They managed to do so both times, but they were far from as dominant as they should have been. In their final Friday game, though, Florida put together an impressive and complete performance against Wisconsin. Veteran Danny Bishop had the game of his life. He was involved in nearly every second half goal and rattled off highlight reel play after highlight reel play. Bishop led the way, but he didn’t single-handedly carry Florida; the team that was solid from top to bottom in the 13-10 win over a Hodags team that was missing a number of key players. Even with Wisconsin missing players, Florida’s performance was impressive and the game didn’t feel as close as the final score. Saturday saw a somewhat similar pattern for Florida. After dispatching Arkansas early in a game that saw star cutter Tanner Repasky suffer a tournament-ending concussion, Florida came out a bit flat against Texas A&M. An early afternoon monsoon put an asterisk on the game, but even before and after the rain, UF never put enough pressure on A&M to get the breaks they needed to win. And then again Florida played a nearly perfect game to end their day. Against Carleton, Florida was absolutely lights out. Even without Repasky, the offense was ruthlessly efficient. Led by a newly confident Hayden Wachob, Florida turned the disc just a few times and punched in their few break chances as well. A rematch with A&M in quarters presented Florida with a chance to redeem their one blip on the weekend, and it looked like they would do just that in the game’s early stages. UF scored the game’s first three points, and Dozen looked completely overwhelmed by the opponent and moment. But A&M turned it around with a quick hold and then a break after a Billy O’Bryan misfire deep. The game really turned, though, on the ensuing point. After another Florida turn, a Texas A&M foul call on a Wachob block incensed them. It didn’t seem like Florida ever recovered from that emotionally. They tried to play hero ball the rest of the game, hucking and turning it, and A&M took advantage of that to the tune of a huge break run to pull away in the second half. Repasky regarded the game as a “mental collapse” that the team could learn from, but overall seemed to take confidence for the season ahead from the team’s weekend performance. The performances against Wisconsin and Carleton were among the most impressive on the weekend. The team’s one consistent weakness in Tampa — a problem with consistently generating break opportunities — should be greatly aided when the four defenders the team was missing return. In spite of the poor showing to end their tournament, Florida did plenty to help their shot at earning a bid for the Southeast and have more positives to take away going forward than negatives. Florida State DUF has a rollercoaster of a weekend. They played neck-and-neck with Carleton and BYU but were never able to play good enough defense to get the breaks needed to win. And they should have beaten Pittsburgh, but collapses out of halftime and at the very end of the game handed Pitt the win. FSU has talent. Peter Van Brussel, Scotty Moore, and Stephen Muir are all capable of making plays against the best teams in the country, but if FSU is to start winning against those teams, they’ll need to learn to better make adjustments and play better team defense. Arkansas Ludicrous Speed had a tiny roster this weekend, and that will likely keep them from making any serious noise this season, but U-24 invitee Kaplan Maurer was one of the best players at Warm Up and Marcus Payne is a nice complimentary piece. A tight game with Central Florida and three straight wins over Auburn, Cornell, and Villanova made for a nice weekend for the South Central team. Brown Brownian Motion will likely look back on Warm Up as the weekend that could have been. They lost to Florida and Auburn by a combined two points, and Cornell and Texas by a combined five. The Auburn loss was especially disheartening, having had a 12-9 lead in a game to 13. The team finished its weekend with wins over South Florida, Arizona State, and South Carolina, but they left some seriously impressive wins on the field. Mac Hecht is a genuine star for them, and gave even the big teams trouble, but Brown’s inability to get breaks cost them those could-have- been huge wins that would have made their weekend truly special. Villanova Main Line similarly let some potential big time wins slip away. Nova had four two-point losses, three of them coming against Texas A&M, Florida, and Auburn. Ethan Fortin and Chris Dixon are two crafty and confident handlers that lead the team’s offense, with Fortin often playing both ways. Jon Collins and Nick Caste are two impressive deep threats, so Villanova has a handful of solid playmakers. They’ll need to improve in those game-deciding moments throughout the course of the season, but they definitely have a ceiling that is higher than many probably would have imagined before the weekend. Plagued by mental mistakes, Auburn Aetos got off to a rough 2-5 start, but was able to regroup and won their last three games. People and teams put different amounts of stock in the value of sideline energy — for Aetos it’s a way of life. “When we have those mental errors and those mental lapses, our sideline is huge at immediately getting in there and cheering for us even when we’re maybe down on ourselves,” said handler Eric Sjostrom after a big win over Texas. “We like to cheer louder after the other team scores. That’s a mental game we like to play. Don’t let them get the moment.” Positive thinking — and a near 40-man sideline led by trombonist Hank Womble — can keep Auburn in every game. They nearly pulled off the comeback of the tournament; coming back from down 8-1 to tie the game at 10s against BYU. Comments on "Florida Warm Up 2017: Tournament Recap (Men’s)"